KINGSVILLE (April 9, 2019) — Dr. Michael Tewes has spent the last 35 years of his life studying the endangered ocelot. Over those years, he has had triumphs and setbacks, but he still works to save his beloved wild cat. During the 37th Annual Faculty Lecture, Tewes addressed some of these attempts to help the elusive ocelot. Tewes began trying to capture ocelots in November 1981 for his doctoral research. He was not successful in trapping one until the morning of March 2, 1982. 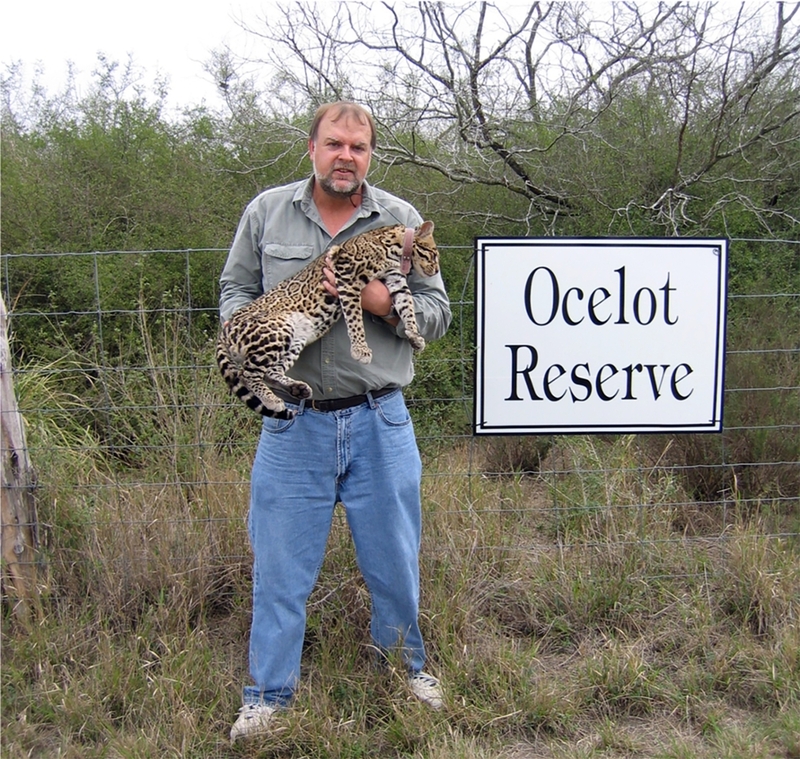 Over the two-year period of his research, he studied 12 ocelots. “I was so used to not catching any ocelot every morning, that I had to drive back to town to retrieve my equipment,” he said. Tewes said there are fewer than 80 ocelots in the United States. They occur in two different environments—between seven and 14 adult ocelots on the Laguna Atascosa National Wildlife Refuge and more than 35 on privately-owned ranches, both located in the Rio Grande Valley. He said those ocelots living in the wildlife refuge are isolated and surrounded by a lethal landscape. On the other hand, the population living on the ranch have a more friendly landscape of cover and prey. A much larger population than the two in the United States lives in northeastern Mexico. Tewes said one of his goals in presenting the Faculty Lecture is to outline a new path “that is strategic, rational and define the actions we should be implementing” to benefit the ocelots. “More than $20 million have been spent in the past 15 years, and I believe we have less habitat and fewer ocelots than when I began working on ocelots,” Tewes said. “Perhaps even more concerning, we squandered 25 precious years in the ongoing countdown to ocelot extirpation within the U.S.
“Unfortunately, public attention and agency efforts over the past decade have focused on the few ill-fated refuge ocelots. In contrast, less recovery effort has been spent on the ranch ocelots which represent a much greater recovery opportunity,” he said. “Ranchers must be a major element of the new paradigm for ocelot conservation. Ultimately, if ocelot recovery is to have any possibility of success in the U.S., ranchers must be the key players to support this effort,” Tewes said. During his time studying wild cats, Tewes has worked with ocelots, bobcats and mountain lions in Texas; ocelots, jaguarundi in Mexico; clouded leopards, golden cats, marbled cats and leopard cats in Thailand; leopard in Africa; and viverrids in Taiwan. To read the entire lecture, click on this link.